Scorpionweed is a member of the waterleaf family. The plant grows to a height of about 18 inches and has bristly stems and hairy, dark green leaves which grow to 5 inches long. 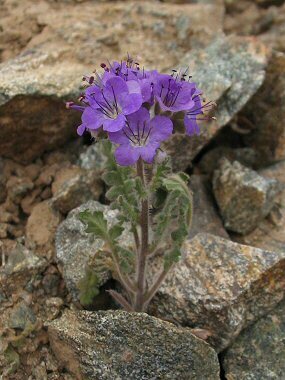 Scorpionweed grows along roadsides and in desert flats and washes at elevations below 4000 feet. Scorpionweed gets its name from its curling flowerhead, which resembles a scorpions tail. The plant blooms between February and May and produces violet, bell shaped flowers which have 5 rounded petals to ¼ inch wide.